Show Those Robots Who's Boss With A Hunting Trophy | OhGizmo! Remember back when the Billy Bass was popular back in 2000 or so? Since then there have been a number of similar items on the market that are equally as annoying as the singing fish. However, these robot trophies have to be the coolest ones I have seen. Since I’m fully expecting a robot uprising within the next decade or so, I would love to put one of these on my wall. That way when a robot breaks into my house to kill me, it knows that I’m someone that’s not to be messed with. 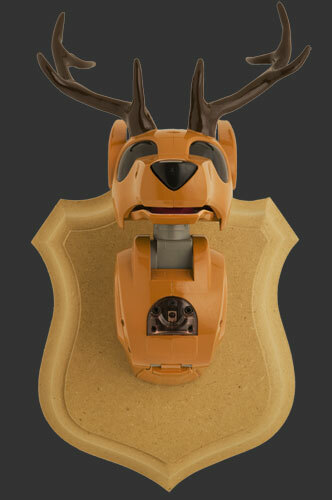 There are 11 different robotic animals which have sensors that will make the robots come to life and become aggressive towards anyone who comes near. Unfortunately there’s no word on pricing or availability. This looks like a I-Cybie. I-Cybie is a robotic dog designed by Silverlit toys that was made by Tiger Electronics. I had one – and I mod it. So this one looks like a hunting price. Nice Idea! Uh… why would someone pay money for this? I think it’s better than Billy Bass!